On Monday the city of Karlsruhe signed its agreement with BAM Sports, the selected general contractor of new Wildparkstadion. Subsidiary of the construction giant BAM Deutschland will deliver the 34,000-capacity stadium in Karlsruhe to extend its already impressive sports venue portfolio, which includes the likes of WWK Arena (Augsburg), Opel Arena (Mainz) and Rudolf Harbig Stadion (Dresden). The new stadium will replace old Wildparkstadion exactly, leaving the playing field intact. 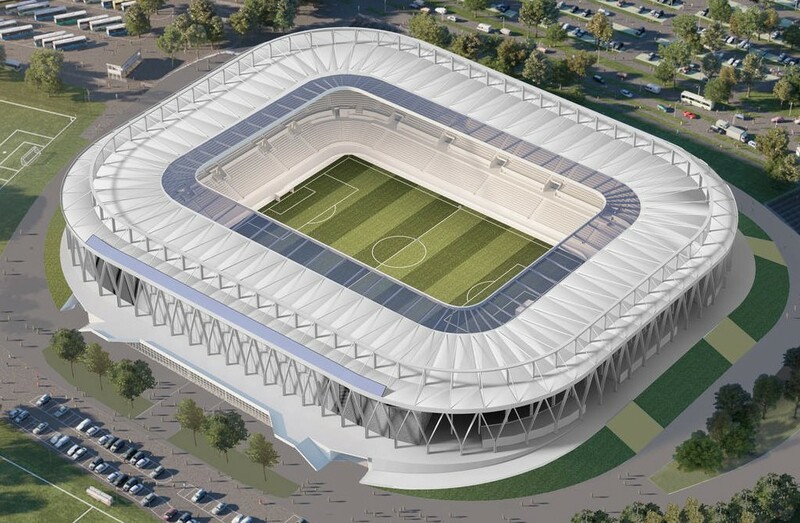 For the first time in football-only layout, the new arena is expected to be built in phased, begining with demolition of old curves (launched on November 5) and erection of temporary sections on both ends. By this means it's hoped to keep capacity above 15,000 throughout the redevelopment. Architecturally the agn-designed stadium will be simple, with key aesthetic feature in the form of Y-shaped pillars, rhythmically surrounding the stands. More opaque facade isn't planned for economic reasons. Lightweight membrane canopy will not allow for the erection of significant solar plant, though panels are planned in the south-west. Officially construction of the new stadium will begin on December 1, 2019. Before that site clearing needs to be carried out. Official presentation of the final design is expected to happen tomorrow, on Nov 22.